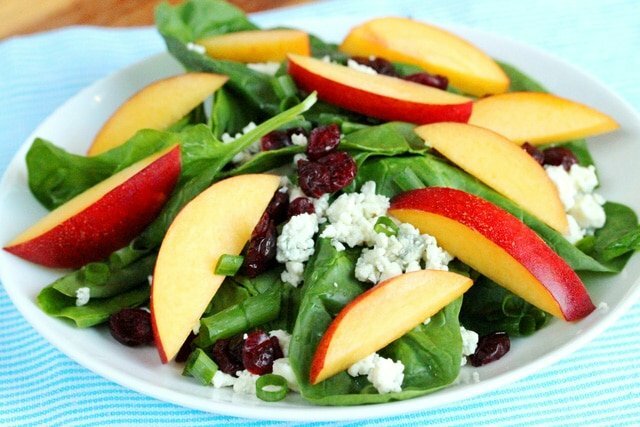 A green salad is so pretty topped with colorful fruit. 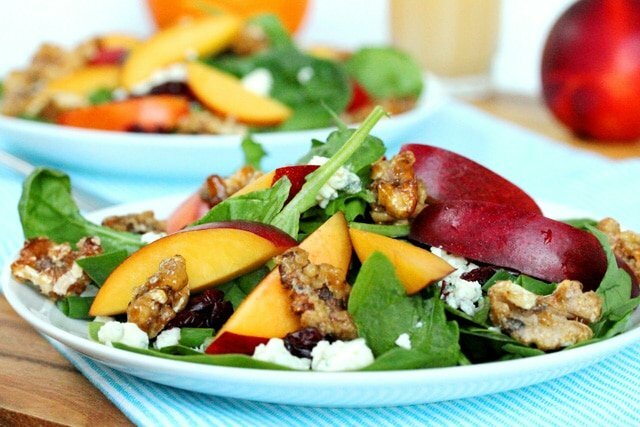 In this salad there are pieces of nectarine and dried cranberries. 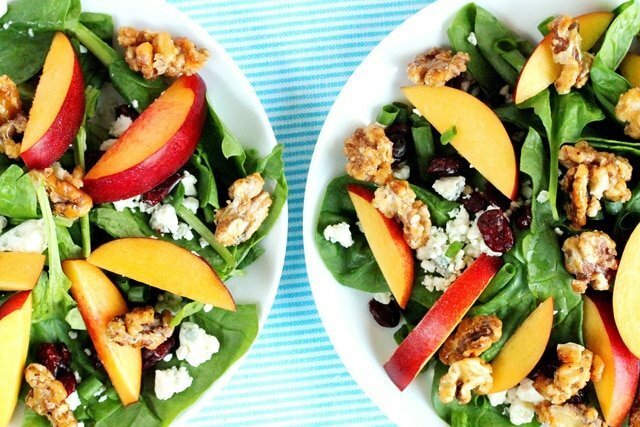 The sweet and tart taste of the nectarine and cranberry tastes wonderful alongside the savory taste of the crumbled blue cheese in this salad. 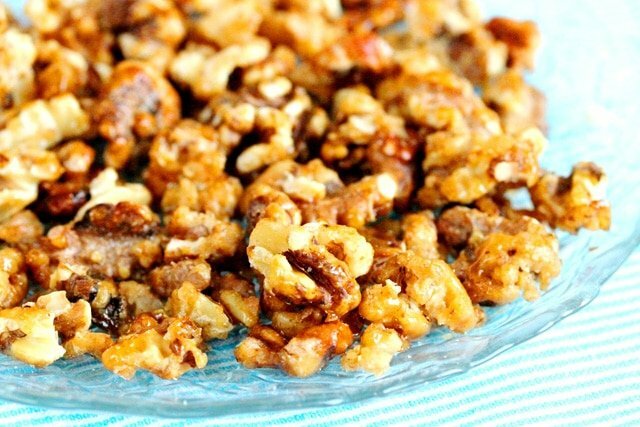 Since nuts go so well with fruit and cheese, it only seems fitting that candied walnuts be added to the mix. 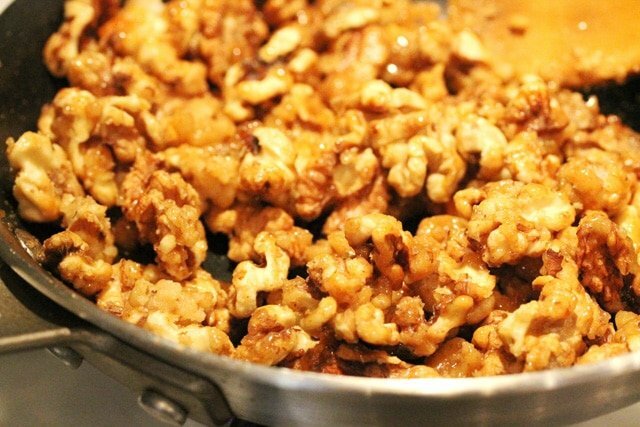 Candied walnuts are easier than you may think to make. 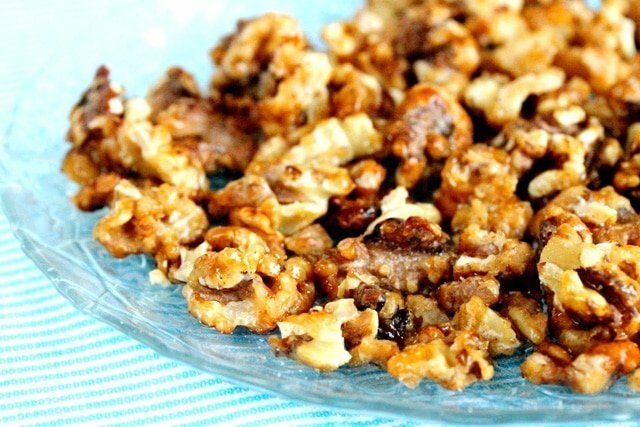 In this recipe the candied walnuts are made with granulated sugar and a pinch of salt in a skillet. 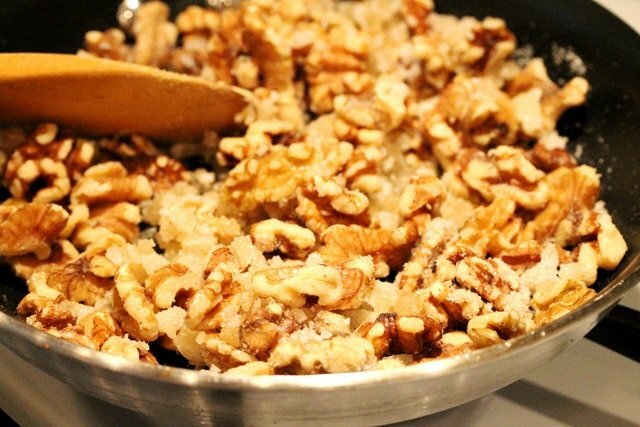 The walnuts and sugar need to be constantly stirred and watched so that they don’t burn. The good news is that they only take 5 minutes to make. 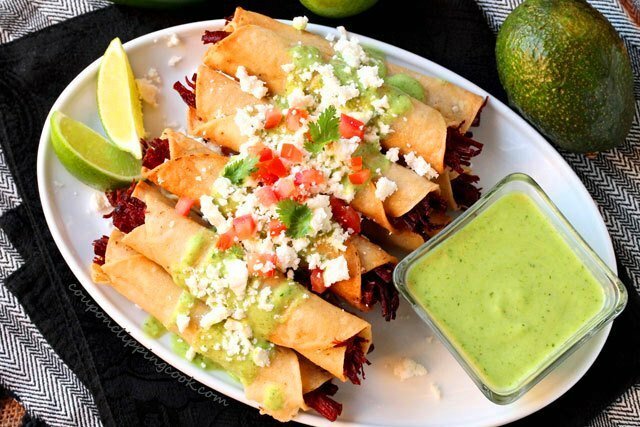 Then they just need to cool before adding them to the salad. But beware, it’s the “cooling” process where it can be risky for the chef because it’s REALLY easy to munch on them. 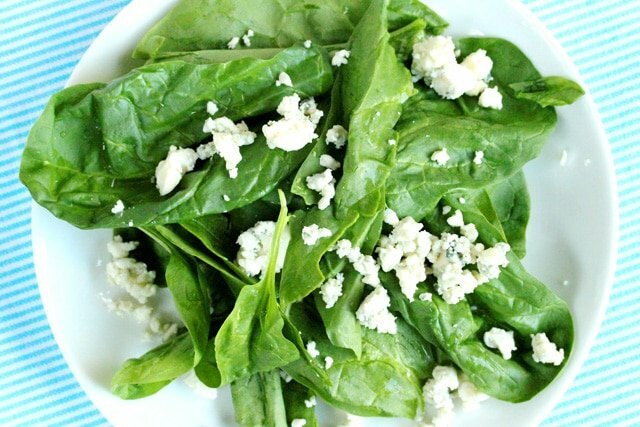 This recipe also includes a delightful orange citrus vinaigrette that’s quick and easy to make. Heat a medium size skillet on low to medium heat. 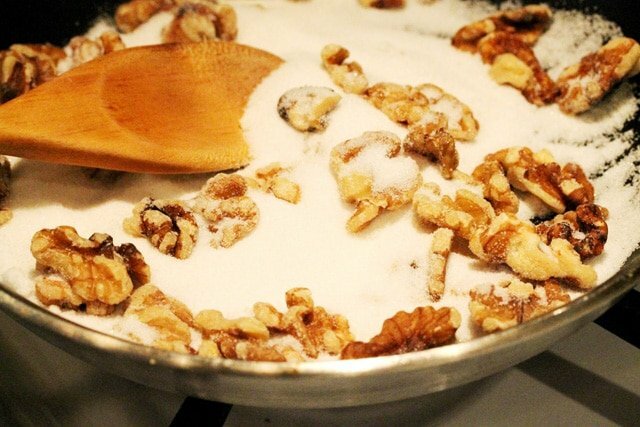 Add the sugar, walnuts and two dashes of salt. 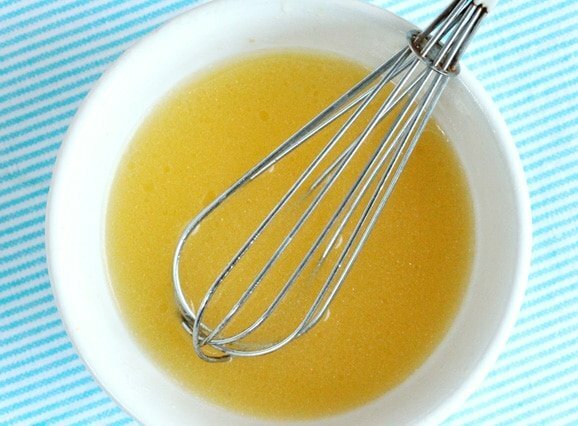 Continuously stir until the sugar starts to liquefy. 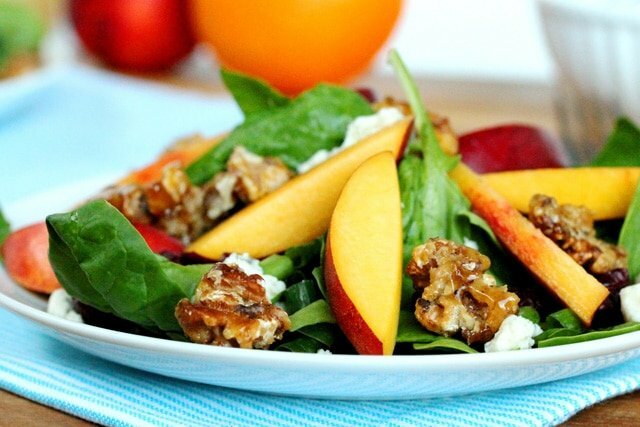 Watch closely so that the sugar and walnuts don’t get too hot and burn. Keep stirring so that the walnuts are coated with the liquefied sugar (about 5 minutes). 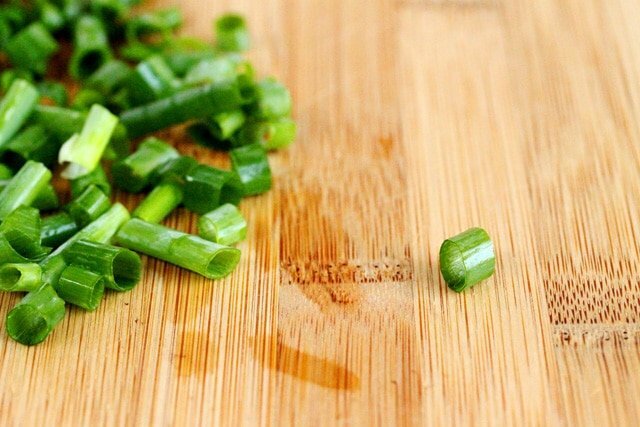 Once done, remove from the skillet and spread them out on a glass plate. 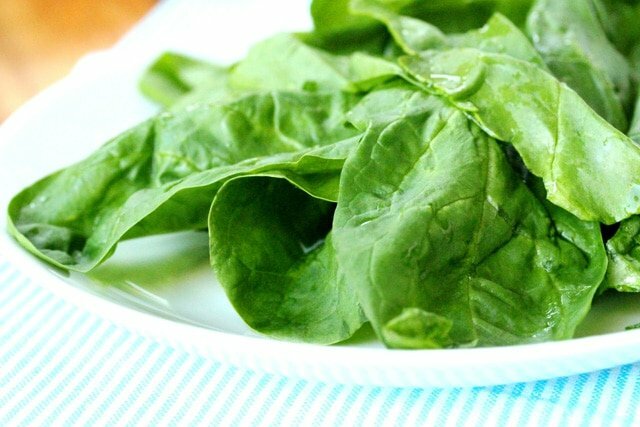 …and add them to the salad. 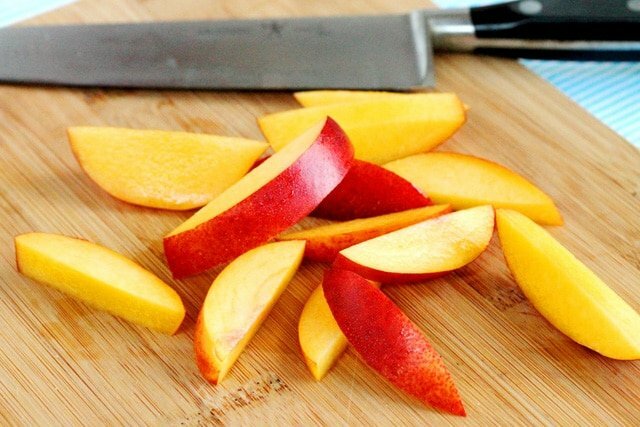 …and cut the nectarines into fairly thick slices (about an inch thick). 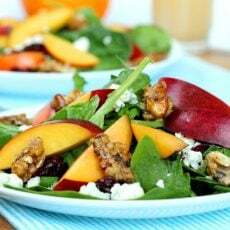 Lay the sliced nectarines on top of the salad. 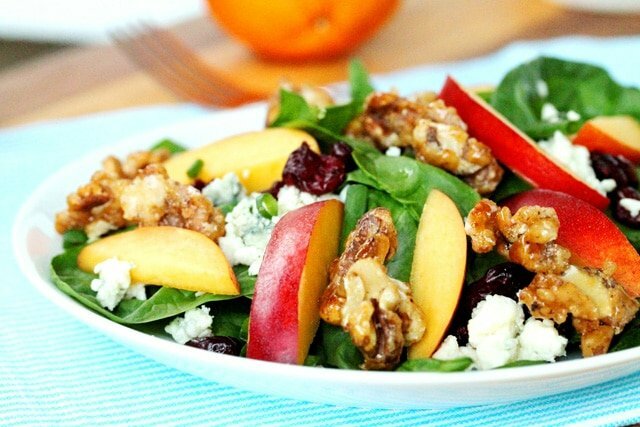 Then top with candied walnuts. In a small bowl, add grapefruit juice, orange juice, sugar, white wine vinegar, olive oil, and salt. 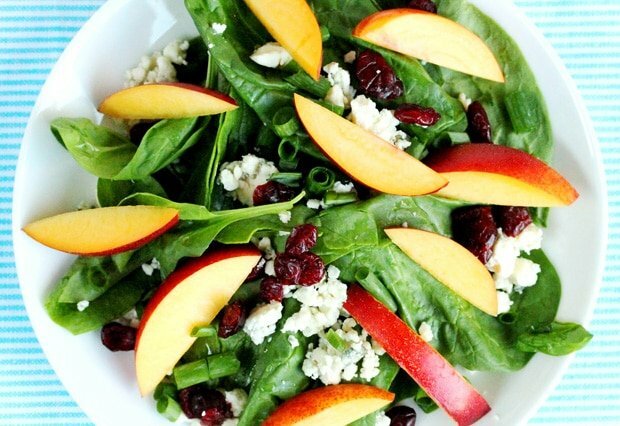 Just before serving, drizzle the vinaigrette over the salad. 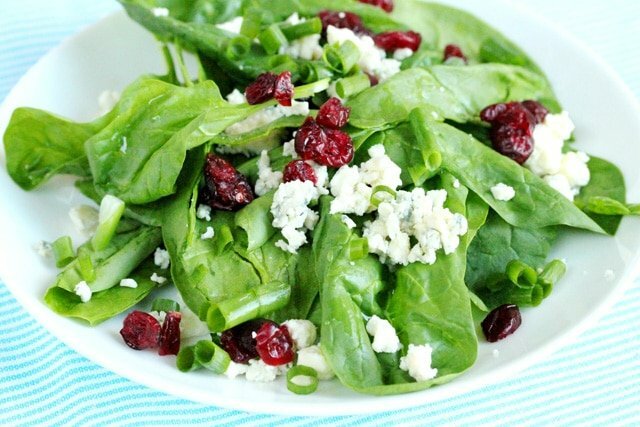 A colorful and delightful salad and vinaigrette with wonderful flavors and textures. Heat a medium size skillet on low to medium heat. 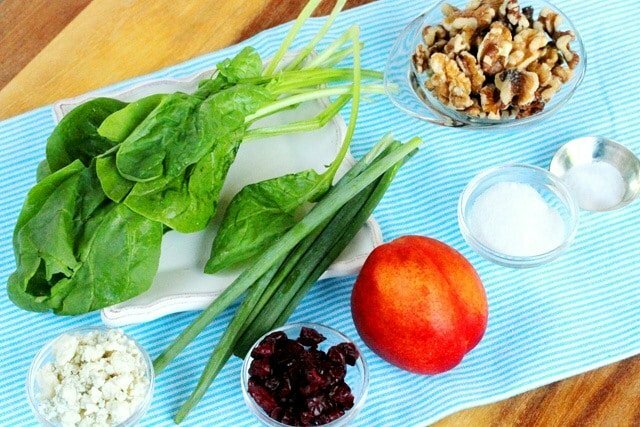 Add sugar, walnuts, and salt. Continuously stir until the sugar starts to liquefy. 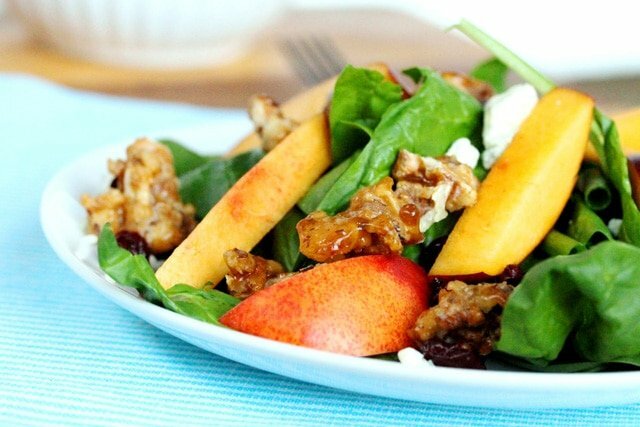 Watch closely so that the sugar and the walnuts don't get too hot and burn. 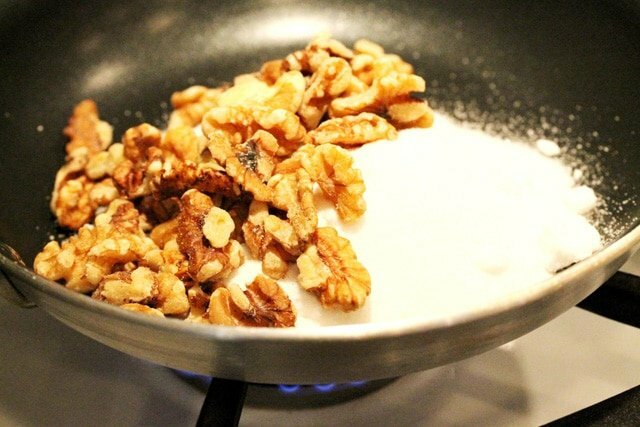 Once done, carefully transfer the walnuts from the skillet and spread them out on a glass plate. Set aside to cool. 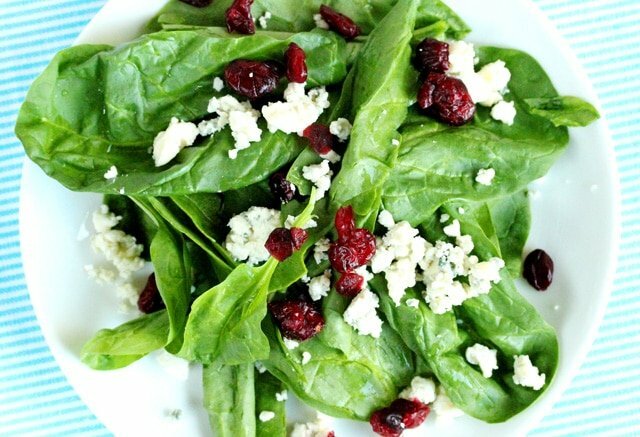 On serving plates add spinach, blue cheese, dried cranberries, and chopped chives (or the tops of green onions). 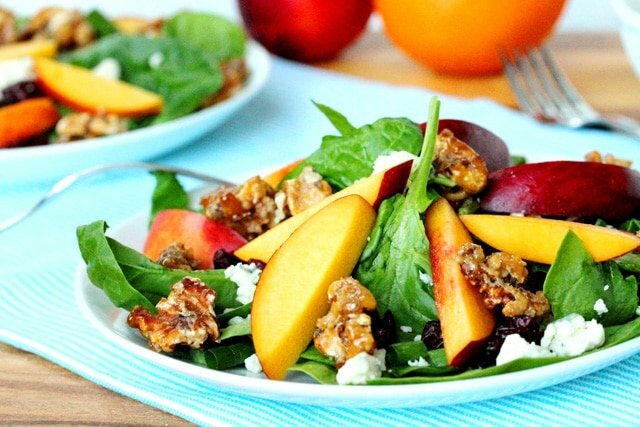 On top of the salad, lay sliced nectarines. 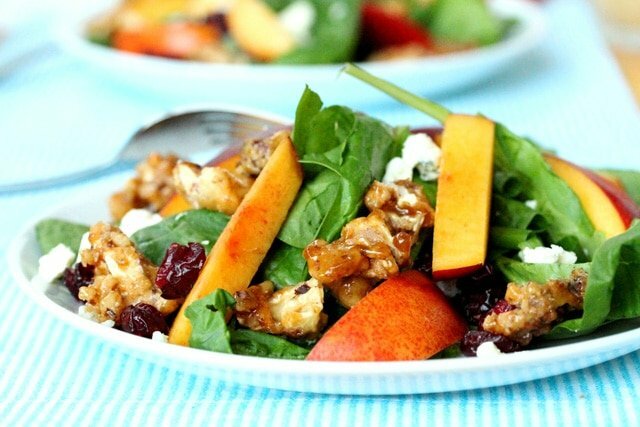 Then top with candied walnuts. 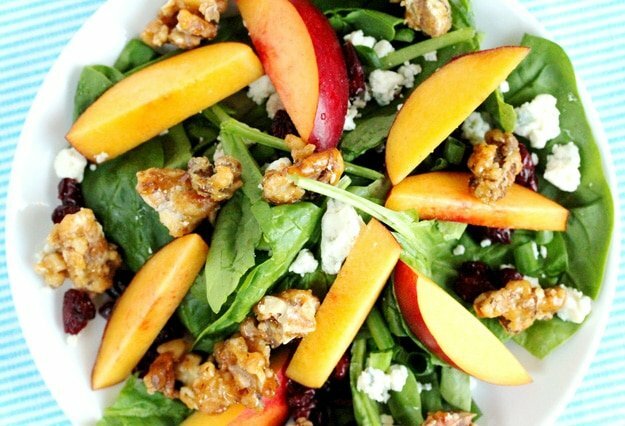 Serve with drizzles of Orange Citrus Vinaigrette. 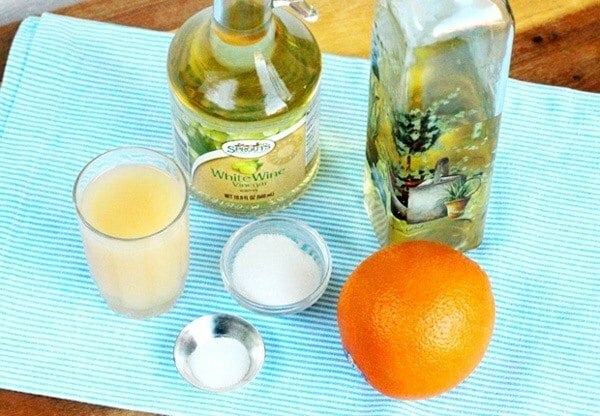 In a small bowl, add grapefruit juice, orange juice, sugar, white wine vinegar, olive oil, and salt. Whisk together. 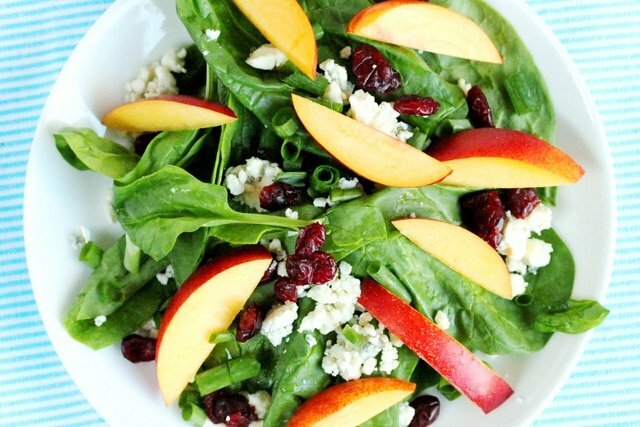 Just before serving the salad, drizzle the vinaigrette on top. Well I sure hoped you saved me some. 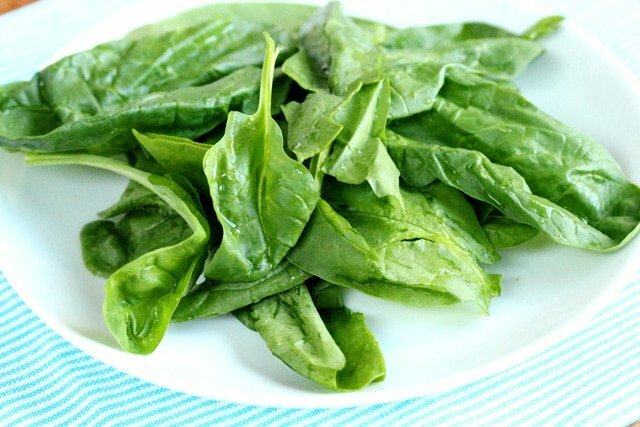 This is a brilliant salad. Hi Kim, of course I did! Thank you.